The excavations described here were carried out by the author on behalf of the Israel department of antiquities in cooperation with the ministry of religious affairs. They were first suggested by Dr. H.Z Hirschberg, Director of the Muslim and Druze department in the ministry, and by prof.L.A Mayer of the Hebrew University in view of the importance at Ramla, and in particular the building complex known as the White Mosque. The excavations began on 25 March 1949 and continued until 4 may 1949, with and interruption during the Passover week. Additional soundings were carried out in February 1956. The author would like to take his opportunity to express his thanks to Rav-Seren Z.Yavetz, then military governor of Ramla, and his staff who spared no effort in assisting the excavators in every possible way. The author also wishes to thanks prof.L.A mayer, who kindly read the manuscript and drew the author's attention to a number of important points and Mr.U.Ben-Horin for reading the first draft of his article and offering a number of useful suggestions. The building complex known as the white mosque is situated at a height of 80 m. above sea-level on a low ridge of hills rising above the vicinity. The entire complex of buildings forms a quadrangle 93 m X 84 m. whose walls are orientated to the cardinal points. To the south and east extends a large Muslim cemetery, and many of the tombs lie close to the walls of the mosque. On the north the building-complex borders on the road leading to Be'er Ya'aqov, and on the west lies and orchard. The buildings constituting the white mosque are surrounded by a wall 85 cm. thick. They include the mosque itself, the long sides of which run east-west, while its main, south wall is also at the same time the enclosing wall of the entire building complex. To the east is a partly destroyed vaulted building. The north wall contains an entrance roofed by a pointed arch. 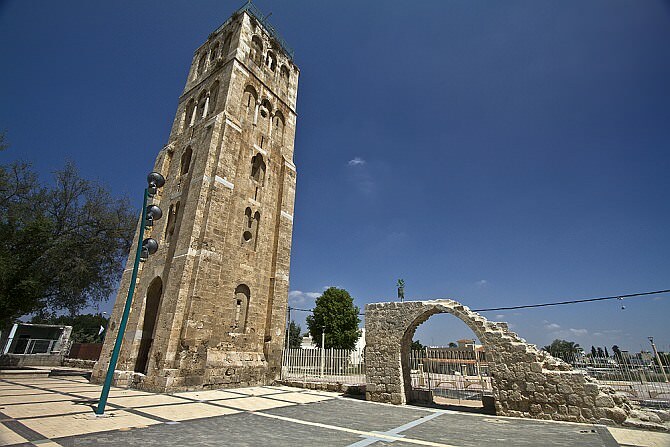 The famous square minaret which is almost completely preserved stands to the west of the entrance. Near the west wall of the minaret is a small building which served as a shelter for the Arab pilgrim who came every year to pray at the tomb of nebi salih. This tomb is housed in a small room in the northwest corner of the courtyard. Most of the west wall of the building-complex is destroyed and its foundations are covered with cactus thickets. Within the area of the courtyard are visible the openings of subterranean vaults their covered entrances. Trial sounding and trenches were dug along the foundations of the building in order to ascertain their plan. The excavations furnished a number of details which supplement the information obtained from survey of the building. Before describing the building in detail, however, a number of points will be dealt with concerning building methods and materials which we were able to determine in the course of the excavations and survey. Three kinds of mortar can be distinguished in the construction of the mosque, they differ in color and composition and indicate at least three phases of building repairs. The commonest is yellowish-white mortar containing grains of brown earth, the second kind is a white mortar with an admixture of numerous charcoal fragments, while the third is bluish and contains charcoal fragments and a considerable quantity of ashes. Two types of plaster should be especially mentioned a reddish plaster is used chiefly on the walls and floors of the subterranean cisterns and also on the floor of the mosque, while the walls and ceiling of the mosque are covered with two coats of white gypsum plaster. The inner coat is 10-18 mm. and the outer 6-8mm. thick. The mosque as well as the minaret is built mainly of a conglomerate of limestone, apparently quarried in the foothills east of Lod. Although the blocks are dressed, the stone is porous. White and grey marble they serve to strengthen the corners and to bond the various parts of the masonry of the tower. The rubble filling used in the walls piers and vaults of the mosque contains numerous marble fragments. Broken marble slabs are also scattered over the entire quadrangular courtyard. Large quantities of broken pottery roof tiles were found in particular in the northern part of the courtyard, where mosaic pavements were uncovered. The white mosque – the building of the mosque is of the broad house type. The interior measurements average 82 m X 12.3m. And the height above the level of the courtyard approximates 7 m. the hall is divided by three rows of piers into thirteen sectors. The centre row is free-standing the other two are engaged wall piers carried cross-vaults, only part of which have survived. The eastern portico, outside the mosque of which parts are still standing, shows that the vaults were covered by a flat roof. The intersections of the vaults are marked by ribs of dressed stone projecting 7 cm. most of the walls of the mosque are still standing, with the exception of the south-west part. These walls are supported on the outside by buttresses up to two thirds of the height of the wall. ost of the cross-vaults in the mosque itself have not been preserved and only traces remain here and there to show their original from. Four out of the twelve piers of the centre row have survived. The main wall, most of which has been preserved does not run in a straight line, it consists of two parts, the eastern. Running exactly east-west and the western, containing the mihrab which deviates from the east west orientation some 6 degree to the north. This section of the main wall of the mosque was probably damaged by a violent earthquake and remained in ruins for some considerable time. After its reconstruction had begun the need seems to have arisen, for reasons unknown to us, to deviate from the orientation of the main wall. It may be that as a result of the use of the area as a cemetery during the period of time when the wall lay in ruins, rebuilding on the told line became impossible due to the presence of new graves. The sounding made at the spot where the wall deviates from its orientation indeed supports this theory, for we found there numerous grave crowding each other at various levels. The mihrab is completely preserved except for patches where the plaster has peeled off. Its vault does not seem to have been ornamented only the wall pier some distance to its left is ornamented with a narrow band of incisions in the white plaster. The façade of the mosque also shows a deviation from the straight line, probably caused by repairs, as in the case of the main wall. The central section of the façade, which includes sectors 6-8 and sector 7 containing the mihrab, has not been completely preserved. What remains of this section is soffit to indicate that an effort was made to give it special emphasis. The moulded and carved decoration and the special treatment of the entrance arches combine to make it stand out against the section to its left and right, which are built in a simpler uniform style. Sectors 6-8 were further emphasized by a higher roof; this is confirmed by the remains of two thin masonry supports on top of the main wall on both sides of sectors 6-8. Windows could thus be provided through which light from above entered the central sector, containing the mihrab. There in no doubt, however that the additional weight on the destruction of the central part of the mosque when it was damaged by the earthquake. Along part of inner side of the wall enclosing the courtyard on the east, runs a portico, most of whose foundation were uncovered during the excavation, its turns westward and at its northern end, where it turns westward it turns westward and forms a corner. At this point, the portico is completely preserved with vaults and roof. Probably the roof of the mosque which has not survived was built in similar fashion. The main entrance, leading into the courtyard of the mosque, lies roughly in the middle of the east wall. Owing to the large number of tombs in this area, its was impossible to uncover the entrance gate in its entirety, and only part of its thick walls was cleared. In the vicinity of the entrance, the portico is paved with dressed stone slabs. South of the entrance, outside the wall, stands a small modern building containing the tomb of Imam Nishay, apparently a Ramla dignitary. In part, this building is built over the foundations of the ruined east wall. Further north, along the outside of the wall, beyond the corner of the portico, were uncovered the foundations of two halls. On account of the numerous tombs found here, which prevented excavation, the purpose of these halls could not be determined. However, a trial trench at one of the corners where the north hall adjoins the wall of the wall of the courtyard shows that the masonry of this hall was not bonded into the east wall. Obviously the hall is later than the enclosing wall of the courtyard. Near the north-east corner of the wall were discovered the foundations of three piers, probably belonging to a previously unknown portico. There piers must have been slenderer than those of the portico along the east wall, because here the foundations are smaller. Nearby were found the remains of a very coarse mosaic pavement, while further to the west, near the tomb of nebi salih, were uncovered large section of a mosaic floor, which served to lead rainwater into a collecting channel. Just outside the north gate, under some 70 cm. of soil, we encountered a platform and three steps built of dressed atone leading up to the gate. In order to obtain further information about the method construction of the north wall itself, two soundings were made one on the outside of the corner other near the tomb of Nebi Salih behind the place where the Arabic inscription is fixed. The wall was found to be built of large dressed blocks; boarding downwards in two offsets each 8-10 cm. wide. The lower part of the wall rested on a foundation of rubble bound by mortar, laid in virgin soil. This wall does not run exactly north-south, like the east wall, but deviates slightly eastwards corner of the mosque, there is a break in the line of the wall, and it deviates here sharply eastward. Part of a later wall with an opening is preserved in this stretch of wall. An examination of this deviating section showed that its foundation consisted of small dressed and undressed stones bound by mortar, resting on white sand approximately 1.6 m below ground level. Nearby the foundation reach a greater depth of 2.2 m. the foundation here are constructed in a manner entirely different from that of the foundations of the north and east walls, which lie 3-4 m. below ground-level evidently the wall was built at the time of the repairs to the main wall and façade of the mosque referred to above. The deviation of the west wall eastwards must have been necessitated by the deviation already present in the main wall and façade. Along the inside of the west wall were found the bases of wall piers. Soundings made opposite two such wall piers inside the courtyard uncovered the foundation of massive piers, apparently part of a row parallel to the wall piers. It may be supposed, therefore, that a portico similar to that built against the east wall extended also along the west wall. The minaret, the detailed plan and sections of which have been drawn up recently, stands in the centre of the north wall. Here the object of our excavation was to the evidence of the inscription on its lintel was erected in 1318, stood on the foundations of an earlier minaret. Soundings made at the north-east and south-east corners of the minaret showed that it stood on the ruined foundations of the north wall. That part of the minaret foundation which is below ground level is surrounded by a stone glacis 1.5 m deep, while the bottom of the north wall foundation is about 4 m. below ground level, and rests on virgin soil. Three cisterns are situated under the courtyard of the mosque, in each flanking the building in the center of the courtyard and the third parallel to the mosque. The openings of the south and west cisterns were repaired by the Mandatory Government and they were accessible to visitors, while the opening of the east cistern had not been located and was uncovered only during the present excavations. the cisterns were built into the sandy soil to a depth of about 9 m. below groun-level. Massive piers, cruciform in plan, carry stone arches springing in four directions, which support the pointed vaults of the roof and the retaining walls. 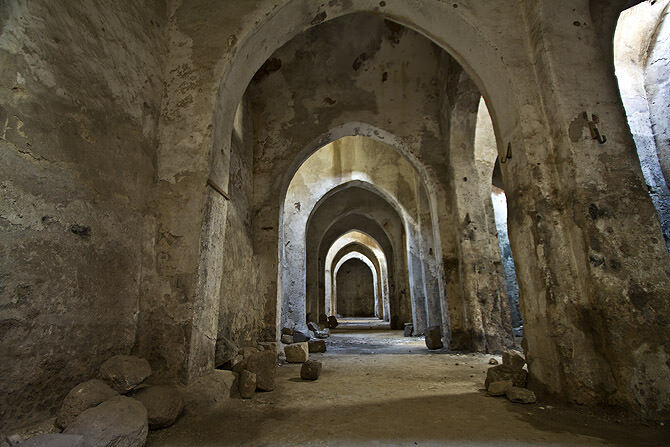 The stone arches, which are orientated at right angles to the vaults, were pierced by small windows intended to improve ventilation between the various part of the cistern when full of water. The west and east cisterns are nearly equal in capacity while the south is lightly larger. In the course of the excavation the method of supplying water to the cisterns became clear. In the north-west corner of the south was found a distribution man hole shaped like a cylindrical bottle and built of stone bound by mortar, through which water was admitted. Into this chamber led a conduit lying 2.7m. Below ground level and entering the chamber below the neck of the bottle. The chamber was joined by a short conduit to a similar chambers, into which were fitted wooden shutters, directed the water into whichever cistern was desired at the moment. A similar valve is also preserved in the chamber of the west cistern. The east cistern on the other hand, wasted by rainwater flowing down from the mosaic pavement near the tomb of Nebi Salih through special channel. Here, no distribution chamber was found and the water entered directly through a pottery pipe fixed at the end of the water channel. The source of the water which flowed through the deep conduit into the south and west cistern can be determined only by additional excavation uncovering westward. However there is some evidence for assuming that this is only a branch of the main aqueduct bringing water from Gezer to Ramla. Parts of this aqueduct were until recently visible and the P.E.F survey which shows the aqueduct marked its course on the map as beginning in the vicinity of abu shushe near Gezer running north to Na'an, circling around ancints Ramla on the south and turning westward in an arc around the white mosque. From here the line continues north and then curves east again in the direction of maqam Imama Ali. This aqueduct is called on the P.E.F. map 'Qenat Bint' el-kafir; the Arabs applied this name also to the ruined cistern near the Ramla Municipality. It may therefore be assumed that the aqueduct, before reaching the cistern near maqam imam ali, carried water by various branches to the cistern en route, including the two under the courtyard of the white mosque. he aqueduct was cut in 1950, when the new road from Jerusalem to Ramla was built, at km. 46-47 and its section is clearly visible on both sides of the road. in conclusion, it should be mentioned that three building phases can be distinguishing in the building complex of the White Mosque. To the first belong part of the main wall of the mosque and of the façade, the east and north walls, the portico against the east wall, and the cisterns. To the second phase belong the rest of the main wall and façade of the mosque, which deviate about 6 degrees from the east-west direction, the west wall and the building in the centre of the courtyard. To the third stage belong the minaret, the foundation of the portico uncovered east of it, and the two halls adjoining the east wall. The pottery – the sherds illustrated in fig.3.A-B were found in the trial sounding and trenches made along the foundation, and in the cisterns and distribution chambers. The stratification was much disturbed and late and early pottery was found together. This probably the result of the steady demand for building stone in Ramla throughout the centuries. Not only stones above the ground were carted away to be used in new buildings. Deep digging was also restored to in order to extract the stones. Therefore, there can be no dependable stratification here, and in the description of the finds their classification will be indicated only in so far as they can be compared with similar pottery found on other excavated sites. Above half of the sherds describe here belong to the Crusader-Mamluk period, whose remains are fairly numerous in the area. Among the pre- Crusader sherds, there are a few which are earlier than the Xth cent. They include number of sherds with plastic moulded decoration of the Abbassid period. The fragmentary roof tiles and ribbed jars of well-baked red pottery are probably earlier. These were found chiefly in the area of the mosaic pavements in the north-west and around the water channel leading to the east cistern. The tiles are made of well levigated light red or yellowish-green clay and some bear reed impressions lamp discovered on the floor of the mosque could have served as evidence for the date when the building fell into disuse, but unfortunately such evidence is unreliable, since this type of lamp has been in use for many centuries and is still manufactured in Hebron today. Among the other finds, a broken head in high relief must be noted. It is made of whitish sandstone; the larger part of the face, the right cheek, and the mouth are missing, the curls of the hair have weathered away, and where the mouth should have been there is a hole which is not extend right through the stone. All this makes the assignment of the head to a definite date difficult, but the modeling of the eyes had hair resembles the art popular in Israel in the Roman period. The figure bears little resemblance to the sculpture of the Omayyad period as exemplified by Kh. El-Mefjer. Especially noticeable is the absence of the prominent ears so characteristic of the Mefjer status. In summarizing the results of the excavation, we must consider very briefly the information relating to the white mosque found in the writings of the Arab geographers and in ancient inscriptions. The first writer to mention the buildings of a mosque at Ramla by Suleiman ibn abd el-malik, the founder of the town, is Baladhuri. He calls it the mosque, and adds that Suleiman succeeded to the Khalifate before it was completed. It was his successor, Omar ibn Abd el-Aziz, who completed the mosque, but only after having reduced the scope of the original plan. Baladhurt does not give any indications of the location of the mosque in the town, and this make its identification difficult. On the other hand, muqaddasi, who wrote in the Xth cent. And knew Ramla intimately, records that the chief mosque of Ramla was in the market, and that it was called el-Abyad, which is the name by which the buildings complex describe in this paper is known today. The question arises whether the mosque mentioned by Baladhuri is identical with the white mosque seen by Muqaddasi. The supposition that both authors refer to the same building fins support in muqaddasi's description of the beautiful minaret of the white mosque, whose construction he attributes to the khalif Hisham, also of the Omayyad dynasty. Further confirmation is furnished by the subterranean cisterns, whose construction resembles closely the Aneziye cistern in Ramla, built in 789. It is therefore proposed to assign the first building phase mentioned above to the Omayyad period. Es-Suyuti mentioning the severe earthquake which affected Ramla in 1033, states that the mosque was reduced to a mere heap of ruins. Here, too, the white mosque was probably meant. On the other hand, Nairi Khusaru, who visited Ramla in 1047, relates that he saw the 'Friday Mosque', in the centre of which was a large cistern. The area of the mosque is recorded as measuring 200 paces by 300 paces. The mosque he refers to was therefore of rectangular plan, and its dimensions are at complete variance with those of the White Mosque, which is almost square. The possible must be taken into account, of course, that the present White Mosque is smaller than the building erected by the Omayyads. A glance at the plan of the white mosque, however, is sufficient to show that it was planned as a unit, with the buildings grouped along the walls and the cisterns below the courtyard, and it is unlikely that the building-plan underwent such drastic alterations. It must therefore be assumed that the white mosque was still in ruins in Khusaru's time, and if so, the question arises, to which mosque he refers. It has already been postulated above that the mosque seen by muqaddasi in the Xth cent. Was identical with the mosque built by the Omayyads in the VIIIth cent. The existence of another chief mosque in Ramla at the same period is unlikely. It is also improbable that so large a mosque Khusaru describes could have been built between 1033, when the white mosque was destroyed and 1047. The author would like tentatively to propose that another building could have served as chief mosque in Ramla in that period, and that is the 'House of the Dyers', built by Suleiman. This building, of which we know very little, may have been fairly large, and may have contained a mosque, like the Omayyad palace at Kh. near Jericho. In Khusaru's time, this building may have been converted wholly or partly into a mosque. This theory is supported by Khusaru's explicit statement that the mosque which he visited contained aq large cistern, a fact already noted by Baladhuri. For a long period, no mention is made of the white mosque Yaqut relates that Salah destroyed Ramla completely in 1187 fearing that the crusaders might again make it their base. Mujir ed-din, on the other hand records the Salah ed-din repaired the white mosque in 1190. From this it may be inferred the most of the parts of the mosque still standing today, belong to the reign of Salah ed-din. The second building phase mentioned above must therefore be assigned to the time of Salah ed-din. 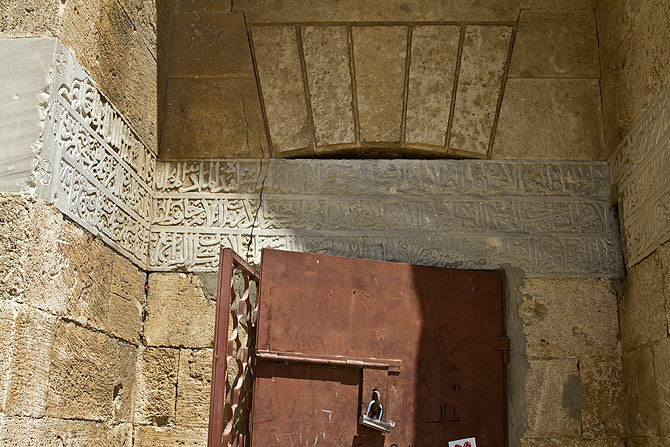 Two inscriptions of the Mamluk period found in the mosque area have already been briefly mentioned above. It should be emphasized that the repairs made by Beybars, mentioned in the first inscription, must obviously refer to the mosque and not to the minaret, which at that time lay in ruins, according to mujir ed-din. 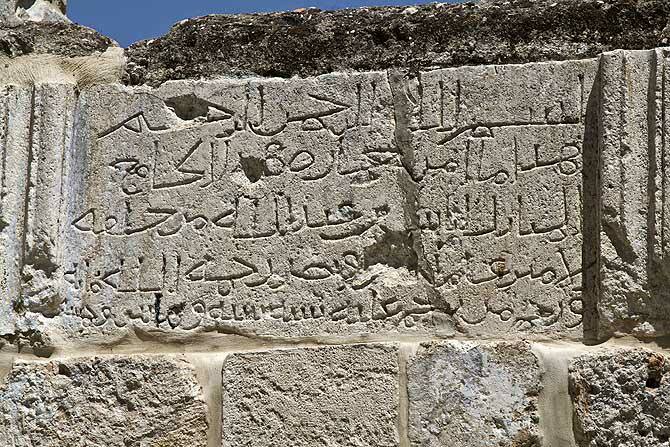 No hesitation need therefore be felt concerning the authenticity of the inscription above, which states that it was erected in 1318 by Muhammad ibn Qalaun.